Over the past few years social media has taken over the world. In some ways or the other, we all have become a part of the “social media family.” While it has been a boon in many ways like long-lost friends getting connected with each other again, help from various groups and getting to interact with like-minded people, knowing many wonderful things just at the click of a button. But social media has its drawbacks too! Yes, this is me saying, someone who is very active on the social media. Social media has made people selfish and competitive in the wrong way. We all know that people post photos of their happy moments and we fall for it. We envy the happy faces, the exotic holidays, the achievements, some men/women becoming more successful, and so on. Most “social media friendships” nowadays have become “friendship with benefits.” A person meets another influencer or tries to find ways by which he/she can benefit from the other. Social contacts have become more of selfish contacts. What is to be done? Like everything, this is also needs to be taken with a pinch of salt. One should know when to step back, where to draw the line, and use intuition to judge right from wrong, friend from selfish interest. One should realize that the virtual world is a lot different from the real world. In virtual world one fights with a stranger, one judges a stranger, one can get affected by the people whom one has never met! So, next time you are envious of a virtual post just step back and take a chill pill. You do not know what’s going on in his/her real life. Next time, someone judges you in the virtual world, laugh it off. They don’t know you as a person. 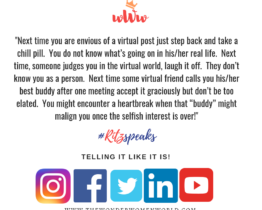 Next time some virtual friend calls you his/her best buddy after one meeting accept it graciously but don’t be too elated. You might encounter a heartbreak when that “buddy” might malign you once the selfish interest is over! Your life is more than the social media. Be more social rather!